Pavlina Atanasova, of Master The Time Concierge, decorated the grounds for a Belmont client. Halloween — long beloved as America’s lone stress-free holiday — has turned on us. Marketing vampires and Instagram showoffs have raised the bar so high that people feel compelled to pay professionals to handle what was once simply a day to give kids candy. Halloween whisperers are earning as much as $125 an hour to shop for severed heads, advise clients on his-and-hers costumes, and spray bushes with spider webs. 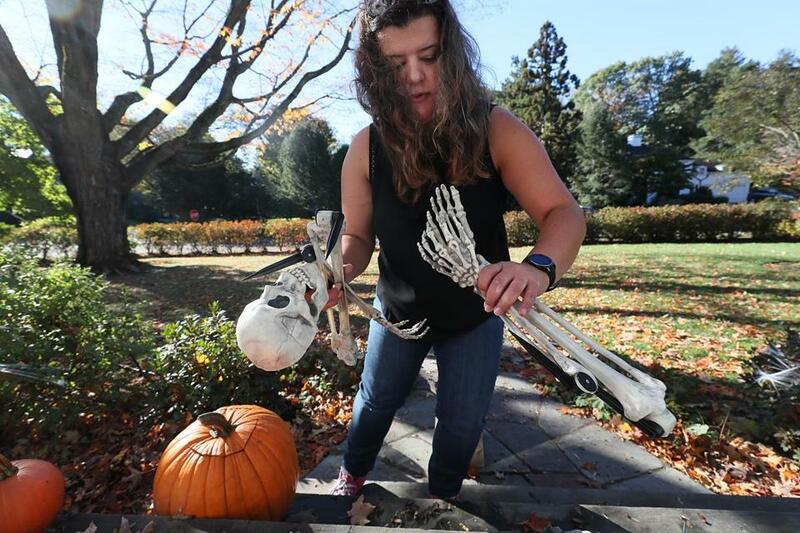 In Chestnut Hill, personal concierge Lisa Schreider spent hours scooping out 10 large pumpkins for a driveway display, a job that left her with a modern workplace injury: pumpkin elbow. Tax accountants and fruitcake bakers have their busy periods; Halloween assistants have theirs. Schreider recalled panicked texts from Halloweens past. One client needed a last-minute pirate’s hat, another realized she didn’t have enough candy. “If it’s a busy family, they can get frantic,” she said. Why are we frantic about pirates’ hats? The better question might be: Why wouldn’t we be? The Pew Research Center did not specifically study corsair-related stress, but it did find that in 2015, in close to half of two-parent households, both parents held full-time jobs. That’s up from 31 percent in 1970. Work-life balance is delicate at best, and that means even a fun occasion like Halloween can tip the situation. When your boss e-mails at all hours, and job security is an issue, it’s tough to take time to peel grape eyeballs. Hilary Berkman, a working mother in Belmont, described the pressure. “The kids are always begging us to decorate our house,” she said. This year, with the holiday rapidly approaching, she and her husband decided to bring in a professional, Pavlina Atanasova, of Master The Time Concierge. “Otherwise we were going to miss the boat,” she said. With people dropping as much as $1,500 for a personalized artisan-carved pumpkin — from Brooklyn-based Maniac Pumpkin Carvers (a figure that doesn’t count shipping charges that run in the hundreds) — the National Retail Federation is predicting Halloween spending will hit a record $9.1 billion. The pressure is mounting to produce a social-media-worthy Halloween display. Her admission came in answer to the following question: Why are you paying someone to bring Halloween-themed cupcakes and decorations over for a breakfast with your kids on Oct. 31? She thought about all that she’s already not doing for Halloween and then remembered one more thing: She didn’t have the red clown face makeup her daughter needs for a costume. “I’ll have to ask [the concierge] to get it,” she said. The retail federation doesn’t track Halloween-expert spending, but in Boston, there’s no shortage of business. Fini Concierge’s Kristin Cantu spent two full days — at $65 per hour — shopping for a Soviet-style military costume for a client, a Harvard Business School graduate. “I did a lot of online searches, and it turns out these sorts of costumes are really hard to come by,” she said. She went to multiple stores — including army surplus shops in Boston and Saugus — and rented part of the outfit from a costume shop. More than $1,000 later — not counting the cost of the costume itself — the client got what he needed. “He said he was a big hit at the party,” Cantu said. 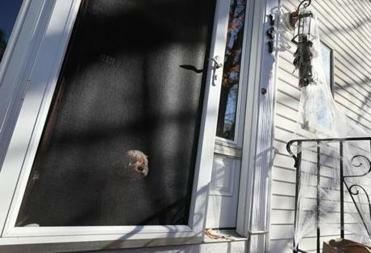 Ginger watched from her owner’s door as a hired helper decorated a Belmont residence. Another Halloween helper, Dani Murray, the founder of Boston Personal Assistant, once spent an entire evening with her team, dipping their fingers in melted wax to make 50 creepy candles for a teenager’s party. This year, she located the perfect Daenerys wig for a client who is a “Game of Thrones” fan. In Back Bay on Friday, personal concierge Christina Kotseas was transforming a client’s five-story townhouse into a spooktacular dinner-party venue. She was turning the foyer into a haunted house; coordinating a Halloween-themed table-scape, with black candles and seasonally appropriate flowers, in the dining room; and readying a pumpkin-decorating station (with safe, pre-carved pumpkins) for the kids. She estimated her fee at $1,200 and spoke about the importance of her work from her client’s perspective. “You don’t want to take the fun out of the holiday by having to do everything yourself,” she said. The client, an event planner herself, with a 7-year-old and 4½-year-old twins, said hiring a Halloween helper frees her from waiting around for chair delivery or sweating the details — benefits anyone could appreciate. Even so, she asked that her name not be used for fear of seeming “spoiled.” “It’s easy to judge,” she said. With Oct. 31 nearing, Schreider, the founder of Lisa’s Hands Of Time Concierge, reflected on the growing obsession to go all out for the holiday. “Halloween takes you away from reality,” she said. Well, it used to, at least.